High-Speed Bi-Folding Doors...Swinging Impact Traffic Doors...or Sliding Track Doors! Our standard flexible transparent, lightly blue tinted, U.V. 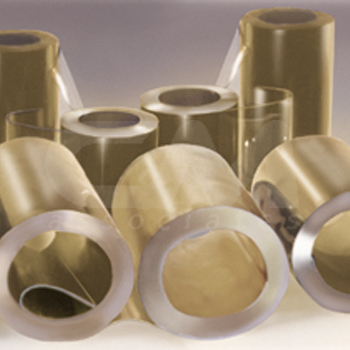 stabilized PVC is recommended for cooler or ambient temperature applications. LOW-TEMPERATURE-USDA This lightly yellow tinted, USDA accepted material maintains its flexibility as low as -40°F. and is ideal for freezer applications. 9/32", 3/8" and 1/2" thicknesses and roll widths from 30" to 60" are available immediately from stock. Other widths and thicknesses are available, please call. Pricing on our replacement panel materials is by quotation only. To ensure that you receive the right product for your application, we prefer to qualify all pertinent information, explore your options, and share with you any helpful information or cost savings tips that other replacement panel customers share with us. 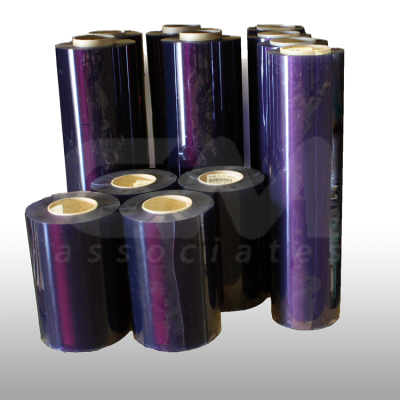 FULL ROLL: Buy a full roll of material and cut the panels to size yourself. This is the most cost effective way of replacing your panels. Shipped within 24 hours. Most Rolls are 66 feet long. INDIVIDUAL CUT-TO-SIZE PANELS Thick PVC panel material can be cut to your specifications. Non-normalized panels are shipped individually rolled, while normalized panels are shipped flat on a specially-made skid. Please allow 1 to 2 weeks delivery. Normalizing: Some door applications require, and some customers prefer, that the PVC Panels are 100% flat. 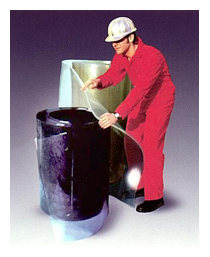 Our normalizing process removes the natural curve associated with PVC materials. Normalized, cut-to-size panel material is shipped flat on special skids to insure that you receive a 100% flat product. Add $17.50 per panel for normalizing plus skid charge for custom-built shipping skid. Velcro® Closures: Cut to size panels are also available with factory-applied Velcro® closure systems. Far superior to pressure-sensitive or solvent-activated adhesives, this new exclusive heat seal adhesive will remain PERMANENTLY affixed to your panels without the need for chemical solvents or grommets!